Collins Booksellers - Innovative Learning for Leadership Development by Julie E. Owen, 9781119073352. Buy this book online. Critically examine the intersections of learning and leadership. Using L. Dee Fink's taxonomy of signicant learning as a scaffold, experts in leadership education explain connections between emerging scholarship of teaching and learning and current trends in leadership, how to develop a more complex understanding of the levers of leadership learning, the environments that promote meaningful and measurable leadership learning, and the evidence behind such a practice. strategies for constructing leadership-related learning outcomes and assessing leadership learning. 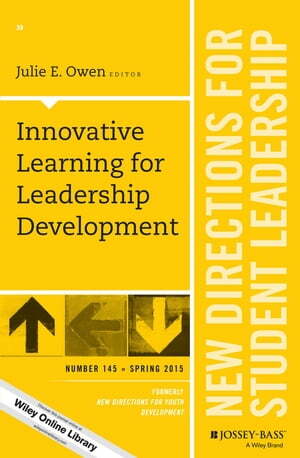 The Jossey-Bass quarterly report series New Directions for Student Leadership explores leadership concepts and pedagogical topics of interest to high school and college leadership educators. Issues are grounded in scholarship and feature practical applications and best practices in youth and adult leadership education.